Vellum is a high-quality form of parchment. Originally, it meant calf skin, but in English the term is used more widely. Like parchment, the skin is prepared to take writing in ink. It was one of the standard writing surfaces used in Europe before paper became available. It continued to be used for high-status documents. The vellum was used for single pages, scrolls, codices or books. To manufacture vellum, the skin is cleaned, then bleached, stretched on a frame called a "herse", and scraped with a knife. When vellum is scraped, it is by turns wet and dry to create tension. A final finish is got by rubbing the surface with pumice, and treating it with lime or chalk. Then it is ready to accept ink. 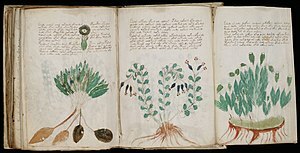 Modern "paper vellum" (sometimes called vegetable vellum) is made out of synthetic material instead of mammal skin, but is used for the same purpose as normal vellum. In ancient Europe, vellum meant good quality prepared animal skin. calves, sheep, goat and even camel are known to have been used to make vellum. The very best vellum was made from unborn animals. It can be hard to identify the animal used to make old vellum without using a science lab. French sources defined velum (or velin in French) as made from calves only. This has remained true in modern times. Most of the best sort of medieval manuscripts were written on vellum. Some Buddhist texts were written on vellum, and all Sifrei Torah texts are written on vellum or alternatives. A quarter of the 180 copy edition of Johannes Gutenberg's first Bible printed in 1455 was also printed on vellum, presumably because his costumers expected this for a high-quality book. Paper was used for most book-printing, at the time. Limp vellum or limp-parchment bindings was used frequently in the 16th and 17th centuries, and were sometimes gilt. In later centuries vellum has been more commonly used like leather. Vellum can be stained virtually any color but mainly isn't, as many people like its faint grain and hair markings, simply its simplicity. Many documents that needed to last long were written in vellum as it was able to last longer than paper. Some vellum-written documents still survive today. British Acts of Parliament are still printed on vellum for archival purposes, as are those of the Republic of Ireland. It is still used for Jewish scrolls, for luxury book covers, memorial books, and for various documents in calligraphy. Today, because of low demand and complicated manufacturing process, animal vellum is expensive and hard to find. Only one UK company still supplies them. A modern vellum-like alternative is made out of cotton. Known as paper vellum, this material is cheaper than animal vellum and can be found in most art and crafting supply stores. Some brands of writing paper and other sorts of paper use the term "vellum" to suggest quality. In the artistic crafts of writing, illuminating, lettering, and bookbinding, "vellum" is normally reserved for calfskin, while any other skin is called "parchment". Paper vellum is made from cotton. Usually translucent, paper vellum in various sizes is often used in applications where tracing is required, such as architectural plans. Like natural vellum, the paper vellum is more stable than paper, which is frequently critical in the development of large drawings and plans such as blueprints. ↑ Johnston E. 1906. Writing, illuminating, and lettering; Lamb C.M. (ed) 1956. The calligrapher's handbook. ↑ Hansen, Eric F. and Lee, Steve N. 1991. The effects of relative humidity on some physical properties of modern vellum: implications for the optimum relative humidity for the display and storage of parchment. The Book and Paper Group Annual.